Discover the courses designed to get you started in your career of choice. AIE will be opening our doors to visitors eager to find out about AIE programmes starting in 2019. AIE's Interactive Experience Labs are a great opportunity to get creative in practical workshops hosted by each school and enjoy a live experience in one of our labs. Important: Booking for this event is required. Please ensure that you book your spot by filling in the form below to reserve your seat. The interactive workshops will will expose you to a hands on test drive session on a topic or software. Workshop: 3D Modeling with Fusion360 (Draughting & Product Design), Learn how to do basic 3D modeling with Autodesk Fusion360, one of the tools used during the draughting and product design programmes. Workshop: 3D Modeling with Fusion360 (Mechanical), Learn how to do basic 3D modeling with Autodesk Fusion360, one of the tools used during the draughting and product design programmes. Come and experience our AIE VR Lab and the use of Virtual Reality in our programmes. Step into the world of Virtual Reality and experience it with an interactive workshop, an out of this world revolutionary experience you cannot miss. Join Event, Why you should attend event? Bring the whole family, parents, brothers and sisters. Get a feel for the campus and scope out the facilities available. Take advantage of those around you and ask questions. Do your research and make sure that your needs will be met. Registration for our open days are compulsory. Attending our open day can crush doubts you may be having about the course you wish to study or the institution you’re considering to attend. Eliminate institutions that actually aren’t suited for you and ultimately shrink your list and help yourself make a decision. 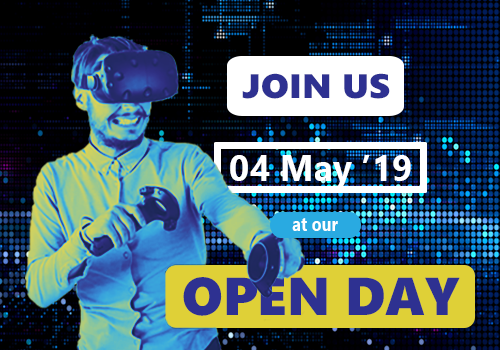 Open days are not only for high school students, they are great for parents, mature working students and even current students looking for a change. Bring the whole family and come prepared with any questions that you may have.